Maybe it’s because I’ve been spending hours, every day, digging and sowing and watering in my Kitchen Garden recently – but planting all those tiny, vulnerable vegetable plants has really given me A Taste of Spring. Broad Beans went in yesterday – the shorter plants, The Sutton, at the front of the raised bed, to absorb as much of the light and sun as possible. Next to go in is a first for me – what will hopefully be Pink Broad Beans, called Karamyzn (I think), another shorter plant, and then at the back a taller version called Masterpiece Long Pod. So a whole raised bed full of Broad Beans, which both Erik and I love to eat. We freeze a lot of these when they are fairly small, (Erik’s job), and he patiently slips the outer skins off each and every one before finally freezing, bless him. So all year round, when the urge for A Taste of Spring takes over our appetites, we can use these sweet beans with such as Tender Stem Broccoli, Asparagus, Crispy French Beans, Peas or whatever is in season, add a knob of butter, some lemon zest and a grinding of spicy Black Pepper and a Taste of Spring is with us once again. But I just have a fancy for some light Spring dishes, and have found ones that sounds delicious. Take a look. 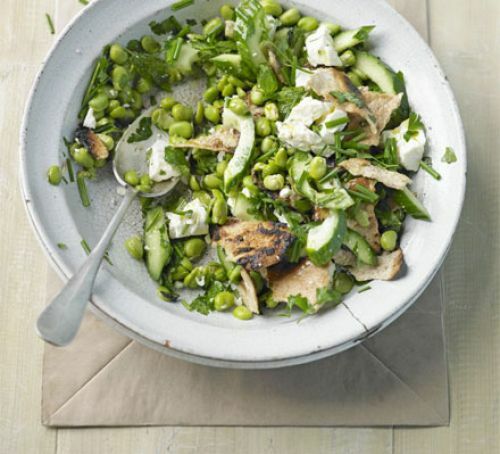 This Spring Green Fattoush recipe is a lovely light spring dish. If you want a touch of heat, add a little finely chopped up red chilli pepper - or to add some colour, add a few halved baby ripe, red tomatoes. It's full of healthy food. First, get all the ingredients ready. Bring a pan of water to the boil, add the beans and boil for 2 - 3 mins until just tender. Drain, rinse with cold water to cool, then drain again. Pod the beans from their skins (they slip off easily), and put the beans into a large mixing bowl. Discard the skins. Halve the cucumber lengthways, scrape out the seeds using a teaspoon, then slice into half-moons and add to the beans in the bowl. Split the pittas so you have 6 thin circles of bread, then toast. Whisk together lemon zest, juice, olive oil and sugar with plenty of seasoning. Pour over the beans and cucumber, add all the herbs and toss together. Tear the toasted pitta into pieces and add this to the salad with the crumbled Feta. Toss together very gently - hands are best - and pile onto a platter to serve. I’m looking for some more light, healthy but appetising Spring recipes to give us all a Taste of Spring, so will add these over the next few weeks. But my favourite Broad Bean recipe of all times is the one I came across a few years ago. Here is a picture of our Broad Bean & Pea Bruschetta recipe, using our own Broad Beans and Peas and made in our old kitchen in Hessle. Click Here for the recipe. 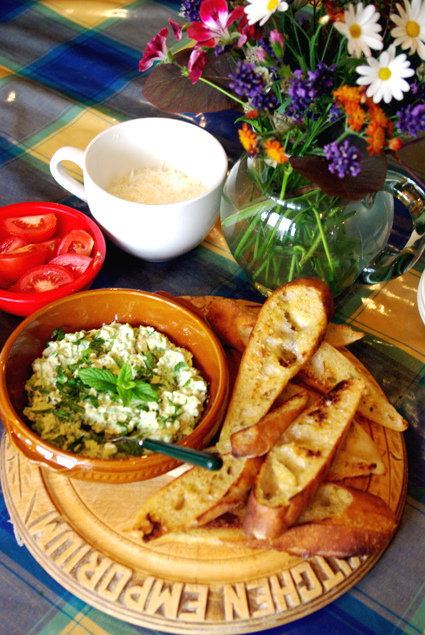 Broad Bean & Pea Bruschetta – very tasty! Oh, I just want to eat this now, even at 8.00am! Time to get dressed now, but just time to say that some exciting times are coming. At long last, after living with a horrible kitchen in our house in Hornsea, we are in the final weeks of planning our new kitchen, and fingers crossed, it will be fitted in mid-September this year. So there is loads of news about my choice of range-cookers, fridge-freezers, kitchen units, islands, lighting etc, and what will really help us is that this new, fabulous room is that it will help us improve our own food photography, to go with our recipes. Must not forget the Kitchen Garden news, and the ritual lighting up of our Wood-Fired oven, plus recipes, recipes and even more recipes. Loads to look forward to, loads to write about and, even better, I am so lucky to have loads of energy, once again. Tales from Our Kitchen Garden. Roasted Sweet Potato & Carrot Soup.